If you have defined and SAVED a custom user interface, but then switched back to the standard interface with the Restore Standard UI button (or otherwise switched back to the standard UI; sometimes tutorial scripts will do this), the Restore Custom UI button restores your saved custom configuration. If you have customised your user interface, this button allows you to easily switch back to the standard user interface. Al long as you have saved tour customisations using the Store Config button, you can later go back to the custom UI with the Restore Custom UI button. 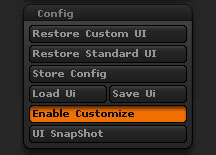 The Store Config button saves your ZBrush interface preferences to a master file. (Saved in…) These preferences are recalled each time ZBrush is opened. Saved preferences also include your selected interface colours, positions of all palettes, and layouts of your floating palettes. Using the Save UI button you can save multiple configuration files and load them when needed using the Load UI button. The Load UI button loads your ZBrush interface preferences from a saved file. These preferences include palette positions, window sizes and floating palette layouts. By default interface colours are not loaded from saved files. You can load interface colours from a saved config file by holding ‘SHIFT’ and pressing this button. The Save UI button saves your ZBrush interface preferences to a file. Saved preferences also include your selected interface colours, positions of all the palettes and layouts of your floating palettes. The saved file can be loaded using the Load UI button. To save your preferences so that they will be recalled each time ZBrush starts use the Store Config button. Turn Enable Customize on to allow you to customise your user interface. Individual controls can be moved by Ctrl+Alt+dragging them. Drag to the canvas area to remove an item – this does not remove it from its palette. With Enable Customize turned on you can also create custom palettes and drag controls into them. The UI Snapshot button creates an image of all the palettes and sub-palettes. Once created, the image will be found in the Texture palette.